Money continues to move into defensive stocks, and this usually takes place when the market is plagued with uncertainty. Also, it is the energy sector that carries the market up during its last leg, and that’s exactly what took place; the energy sector was the driving force behind the highs the Dow set this year, and it is what could potentially push the Dow to test its highs one more time. A healthy financial sector is one of the necessary ingredients for a bull market. 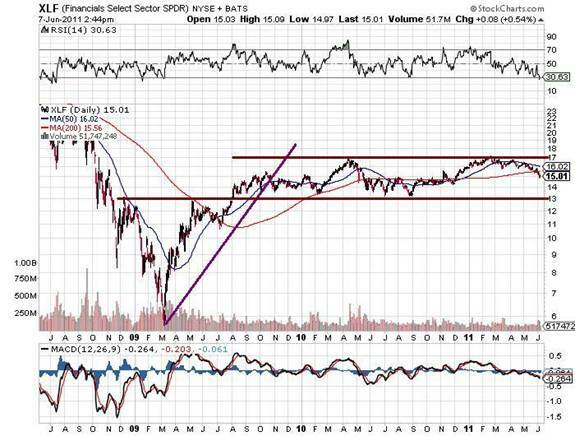 In 2009 shortly after our smart money indicator generated a buy financials exploded upwards. In 2010 their rate of ascension was mediocre to non-existent in comparison to 2009; coincidentally this was around the same time we turned neutral on the market. At present this sector is under-performing. This under-performance can clearly be seen in the 1 and three-year charts of XLF (the Financial ETF). 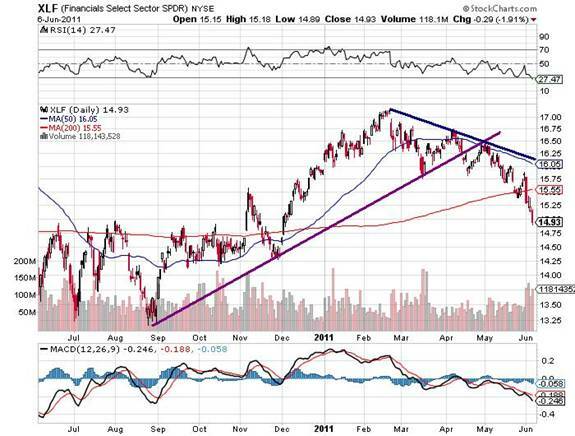 In the one year chart of XLF, the uptrend has been violated, and it is now testing important short-term support at 14.75. XLF topped out in Feb, while the Dow rallied until May before putting in a top. If the financial sector was healthy, then it should have rallied in Unison with the Dow. Historically for a market to move higher the financial sector or the housing sector has to be in good shape. The housing sector is in the doldrums, and the financial sector is far from healthy. The three-year chart clearly reveals how bad things are. XLF topped about roughly the same time the buy signal issued from our smart money indicator turned neutral. As of April 2010, XLF has done nothing but trend sideways. A weekly break below 13 will be a very strong warning signal that the market is close to breaking down. If you look at the chart of JPM, the pattern is worse. It topped out towards the end of 2009, and since then it has been trading in a very tight range. 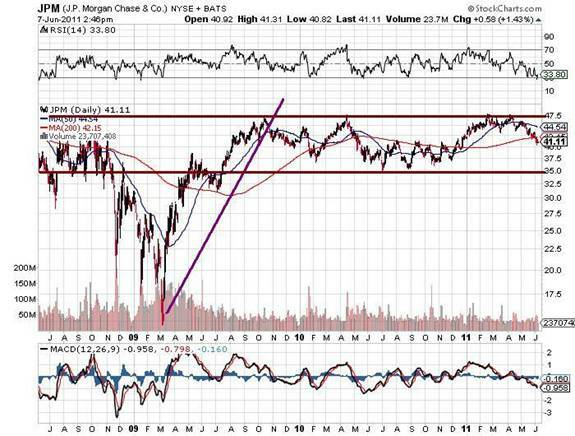 This is telling because JPM is the nation’s second-largest bank and this chart clearly illustrates that the market does not think JPM is out of the woods yet. The chart of Bank of America the largest bank in the nation looks even worse. Finally, for the first time in many, many months, our V Index has experienced a small drop; V readings dropped from 2140 to 2135. It is too early to tell if this is a trend change but until they drop to or below 2000 the markets are going to remain very volatile. The Dow is at a precarious point; it needs to turn around shortly or risk breaking down. There are a few factors that indicate the Dow is getting ready to mount a rally from these levels. If the SP 500 and the Dow are unable to stabilise at current levels, then they could test their March lows, 1250 and 11500. If this takes place, it will confirm that the market has already topped and that any rally from these levels is going to lead to a lower high. Dumb money has started to become increasingly negative, the premiums of puts are rising, and the market has still not closed down on a very high volume day. For example, the market closed in the red on volume of only 4.02 billion shares. Volume continues to rise slowly on down days, but there has been no spectacular surge in volume yet. Finally, the dollar could potentially test its lows, and if this takes place, it will provide the fuel the Dow needs to rally. Traders who opened up long positions and are getting nervous can close all the positions that are showing a profit. From a long-term perspective, the Dow has hit all its targets and long-term traders should be out of the markets; they should be only getting into Strangle plays, short positions and maybe selling put options. Until a full sell signal is generated, we believe the best strategy is to open up a strangle position. When the markets issue a sell signal, we can start to scale into put options only. So far, we have five strangle positions and are actively scouring the markets for more plays. Remember that these plays will start to bear fruit after the market experiences a huge move; the direction is not important. As we have over one year of time on these options, it seems highly unlikely that the market is going to trend sideways for over 12 months. 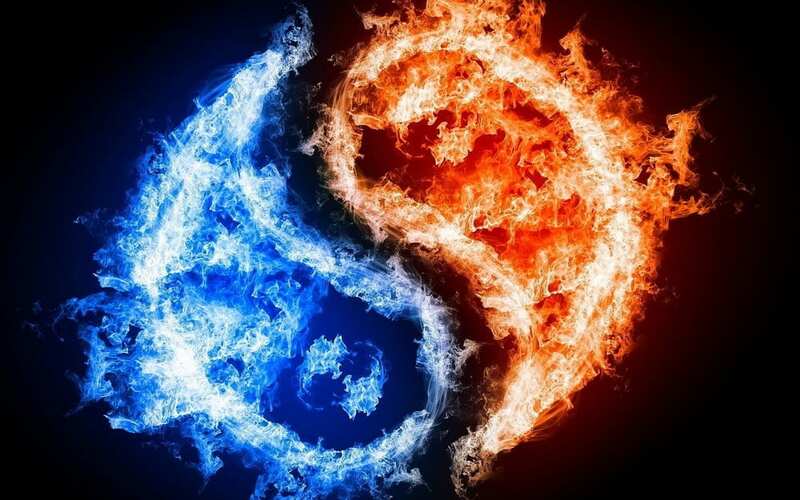 With such high V readings, a strong move is bound to occur sooner or later.